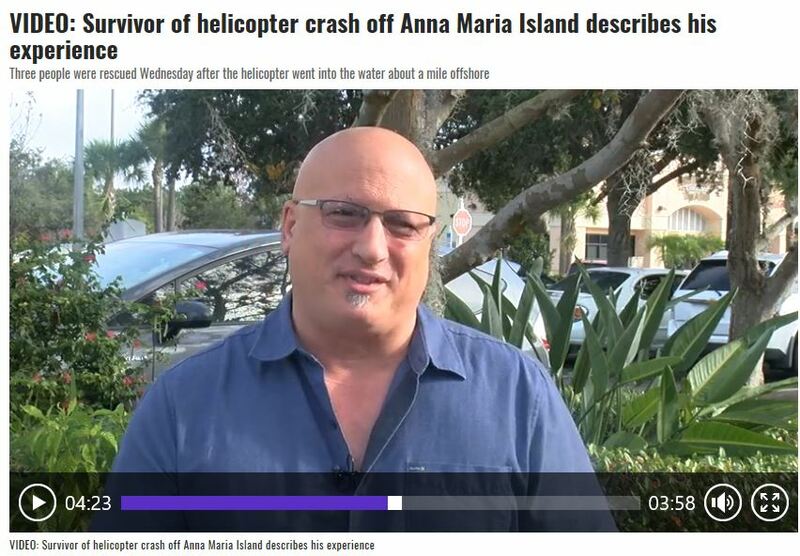 SARASOTA (WWSB) - Thomas MacKnight is thankful to be alive after the helicopter he was in crashed into the water about a mile offshore of Anna Maria Island on Wednesday. It happened around 11am. MacKnight was one of three people in the R44 single-rotor helicopter belonging to Sarasota Helicopter Services LLC. MacKnight says the pilot, Stanley Lee, is one of the best in town and he’s flown with him many times. They were shooting video, hovering around 10-15 feet above the water like they normally do, when all of a sudden they hit the water. MacKnight says he was immediately underwater. He had been through safety demonstrations before, so he knew what to do. First, he detached himself from his seat belt and started to try to get out of the helicopter, which had tilted in the water, so he was facing towards the sea floor. “I got out of the helicopter but I got hung up on something and the helicopter was going down and I looked up and saw the sky going away. Honestly, I thought, ‘This is it,’” MacKnight recalled. “When I thought it was going to be my last breath, I wasn’t concerned or upset. As soon as I thought that, I popped away and came up to the top. I looked around for everybody and saw everybody was up. Then I pulled the cord on my life preserver,” said MacKnight. He says he couldn’t see anyone and didn’t know where everyone else was until he reached the surface. It happened so quickly, it was hard to take anything in, even to understand what had happened to him. “Stan was obviously in very bad condition. I went over to him. By that time, the boat that we were shooting had come back. They jumped in and were helping us. I told them to go get Stan,” he said. The passengers on the boat were able to pull all three people from the helicopter out of the water. The U.S. Coast Guard from St. Pete responded, putting two of their crew onto the boat to help with first aid efforts and then escorting the boat Coquina Beach to have the victims transported to the hospital. Stanley Lee of Sarasota was taken to Blake Hospital under a trauma alert and he is listed in critical condition. MacKnight was taken to Blake Hospital with non-life threatening injuries. Peter Bowden had only superficial wounds and refused treatment. But he’s praying for his friend, Stanley Lee, who was hurt badly, and telling others to keep what’s really important at the forefront of their minds. “Life is precious. We’re all here for some reason, I think. Respect the fact that you are here. Love the people that are closer to you and the people that are not. Every day is a gift and you should use it as you should. I almost didn’t have a today," said MacKnight. “Treat each bother. Let’s make life better while we’re here." 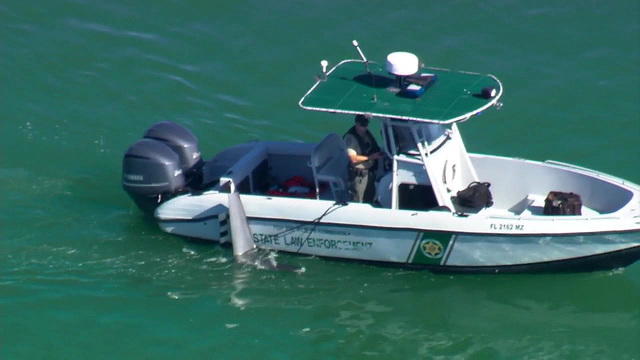 Multiple agencies responded to the scene, including Florida Fish and Wildlife Conservation Commission, Longboat Key Police, Sarasota Police and the Manatee County Sheriff’s Office, to assist the Coast Guard. The sheriff’s office located the wreckage using sonar and marked the location. The FAA and NTSB will follow up with removal and further crash investigation. It’s still unknown why the helicopter crashed.